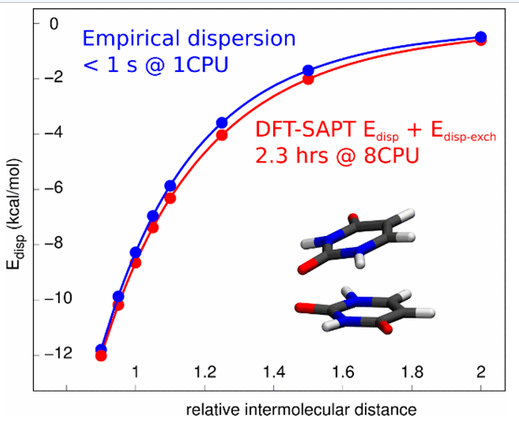 Sedlak and Rezac presented an approximation to DFT-SAPT that replaces the ab initio dispersion terms in the popular but expensive SAPT calculation with a potential that is based on Grimme’s D3 dispersion. The D3 dispersion correction has become a popular way to improve the accuracy of DFT geometry optimizations and thermochemistry calculations for systems involving noncovalent interactions, and as applied to DFT-SAPT improves the efficiency of DFT-SAPT calculations. They demonstrated with the S66X8 and S66X6 test sets that this correction has root mean square errors of less than 1 kcal/mol for non-charge transfer species. I think this could be useful to anyone who is looking for a more efficient way to do energy decomposition analysis who has previously used DFT-SAPT, or anyone who is interested in noncovalent interactions and dispersion corrections to DFT.